Sanquhar is a historic market town that dates back to the 9th century in the Nith Valley in Dumfries and Galloway located towards south of Scotland, on the River Nith. 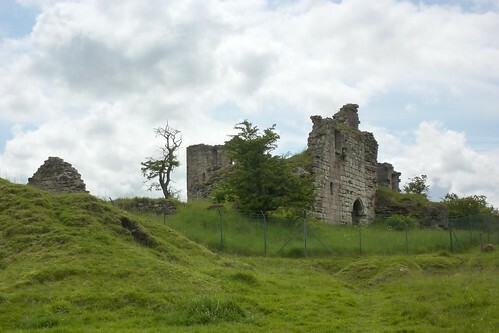 The name Sanquhar comes from the Celtic meaning ‘Old Fort’.It lies in the north of Thornhill, west of Muffat and in the north western part of the Dumfriesshire County. It is located amidst the rolling pastures and beautiful hills. This town is known for its tiny post office which was established in 1712 and is claimed to be the oldest working post office in the world. 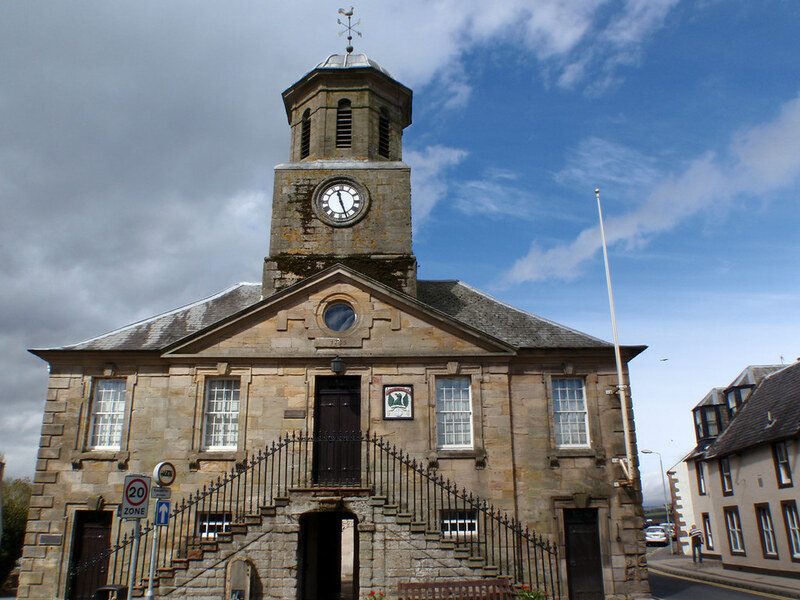 This town is linked with many historical happenings; it was the place where the Covenanters, who opposed episcopalisation of the church, signed the Sanquhar Declaration renouncing their allegiance to the King. There is a monument in the main street to commemorate this event. Sanquhar is a popular tourist destination with shops, accommodation options and a range of places to eat. Sanquhar was legally recognized by the crown as early as the 14th century and was made a royal Burgh in 1598. Despite the political unrest in the area agriculture began to flourish in the early 1700s. Many industries began to function, particularly Coal mining. Coal had been dug in the area for hundreds of years, but more advanced methods helped the industry grow. Other than coal mining weaving, carpet making and forges began to flourish in Sanquhar. During the 18th century wool trade contributed a major portion of the Sanquhar economy. The Sanquhar Wool Fair, held in July, regulated the prices for the whole south of Scotland. A distinctive two-colour pattern of knitting which is widely known as 'Sanquhar knitting' takes its name from this small parish. The other major industry came in the form of a carpet factory along the Crawick River. The carpets made here were best in quality and has durability, it gained international recognition and major portion of the carpets were exported to foreign countries. With the advent of industrialisation the traditional industries began to decline that in turn affect the progress of the town which heavily depend on these traditional industries. Sanquhar itself prospered through the late 1800s and early 1900s. The decline of traditional industries in the middle of this century hurt the town, but now new manufacturers are entering the industrial field. 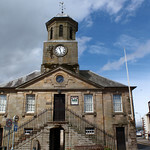 William Adam, a famous Scottish architect designed the Tollbooth in the centre of town, which is the only surviving building of this type designed by him. Built in 1731, much of the building materials for it were taken from the old castle in Sanquhar and it is currently used as the local town museum, containing local artefacts and memorabilia. The curling game has a deep link with the culture of Sanquhar people. The town has the world's oldest curling society, formed as early as in 1774 with sixty members. James Brown, who penned the history of the town, is credited for writing the rules of this sport. The witches of Crawick were known for casting hexes on other teams. Some of the tournaments gave sack of grain as the prize and the winning team would distribute it to the poor and needy in their hometown. To aid the local charities the Sanquhar pantomime group annually performs a traditional Christmas pantomime. "Riding of the Marches" an annual week long celebration is conducted by the Royal Burgh of Sanquhar. As part of this celebration a "Queen" and her "Attendants" are selected from the four year girls who are studying in the secondary school. There will be a parade of Lorries and Horses as part of the festival procession. Many of the pubs will be busy during this time, indeed it's been noted that some publicans begin to have delusions of grandeur during this period. The railway station which was used for freight and passenger traffic was reopened only in recent years.Accommodation in Sanquhar extends lot of choices for the visitors including the hotels and self catering cottages. The cottages in Sanquhar offers spacious and comfortable rooms with all sort of basic amenities and a congenial atmosphere to gear you up to explore the tourist potential of Sanquhar. It has a beautiful 9-hole upland golf course with spectacular views of the surrounding countryside, which attracts many golfers from all over. 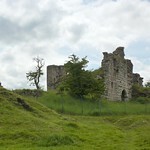 Ruined mediaeval castle near Sanquhar in Dumfries & Galloway. Walk up to view.